As far back as Bill can remember, he wanted to be an Artist. However, he was born in Oakland, California during the Great Depression of the 1930's. The odds for Bill to ever pursue his dream of becoming an artist were stacked against him. Buying art supplies or paying for lessons were out of the question. Most of the money earned by his father went for food and a roof over his family's head. Like most Depression families money was scarce for the Sala's. After the start of the Second World War his father went to work in a Bay Area shipyard. But their financial situation did not improve much. His father experienced a setback when he was injured at work. He suffered with this injury throughout the war years and was not able to work full time. Bill's mother had to work to keep the household afloat. That really put an end to Bill's thoughts of attending art school after high school graduation. While Bill felt he had a natural talent for painting, he was concerned that he would not be able to find employment as an artist, or earn as much money as he could working as a mechanic in the construction trades. So he continued in his construction job, painting as often as possible after work and on weekends. As time went on and his family commitments demanded less of his time, he was able to devote more time to painting. Bill began entering his work in local Bay Area juried art shows. His work was well received and during the next several years it garnered numerous awards. With the awards and success came invitations to exhibit his work in several private galleries and community exhibitions featuring local artists in the San Francisco Bay Area. He was building a reputation as an accomplished artist. However, during the early 1970’s, the demands of his construction work increased and he was not able to devote the time to his art as he would have liked. Bill felt that it was unfair to the galleries showing his work to continue their relationship because he was not able to provide new works of art, so he removed all his paintings from their galleries. While this may have been the right thing to do in respect to his commitment to the galleries showing his work, it took his work out of public view resulting in a great loss of exposure and potential revenues. However, during the next 15 years of employment in construction he continued to paint. 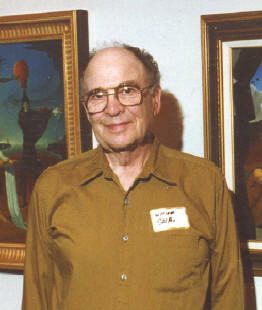 Bill only exhibited his work in a few select art shows and exhibitions. In 1991 he took an early retirement to pursue his art and began painting full time. Bill says, “I really do not like to use the word 'retirement', because since I started my new career as a full time artist, I am working more hours and harder than when I worked in construction”.